Mango Blueberry Parfait. It is a hot, hot summer, and I take any opportunity I have to whip up a refreshing, frozen dessert. 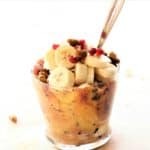 This is my new favorite summer toy, the Dessert Bullet, (link in Resources) and it allows me to freeze any kind of fruit, and make a delicious, nutritious dessert in minutes. 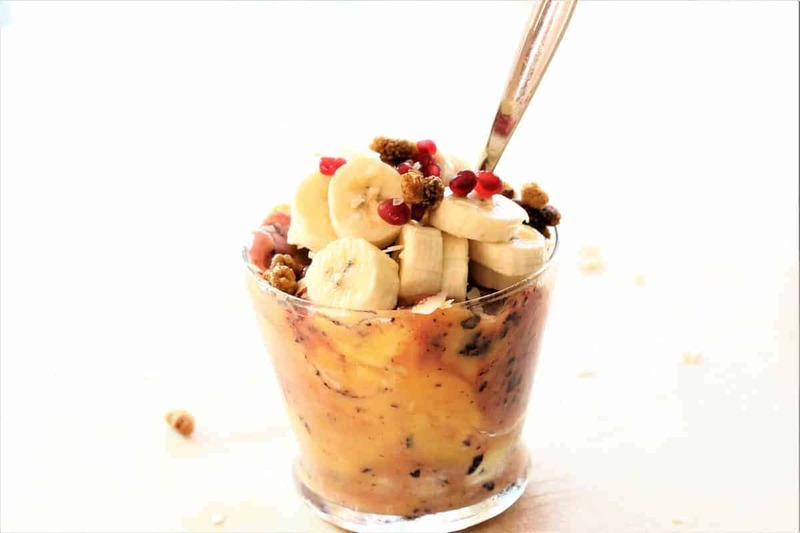 Today, I used 2 cups of frozen mango, 1 cup of frozen blueberries to make the parfait, and then topped it with 1 banana, toasted coconut, pomegranate seeds and dried mulberries. It has no added sugar, color, preservatives or additives, so even though this is totally decadent, you can feel good about eating it or making it for the kids. Enjoy! Delicious frozen mango blueberry dessert! Topped with 1 banana toasted coconut, pomegranate seeds and dried mulberries. For another variation, try the Banana Blueberry Nicecream Sundae.